The Windows default program switching keyboard shortcut is Alt+Tab.I’ve earlier shared how to Preview Windows which switching programs using Alt+Tab.Today I share Vista Switcher is also a Alt+Tab alternative that replaces the default Windows Alt-Tab to switch between windows dialog with preview box that shows a list of all running programs, with their names and preview snapshots, and allows switching tasks, minimize, maximize, restore the main window, close the process and grouping of windows from the preview itself. Switch between the windows in the preview windows using arrow keys / mouse scroll as opposed to repetitive (Alt+Tab) keystrokes. Minimize, maximize, restore, cascade, tile vertically or horizontally, close or even end the process from the preview. Select multiple windows and apply the same action to all of them. Switch Between Windows Of The Same Application. 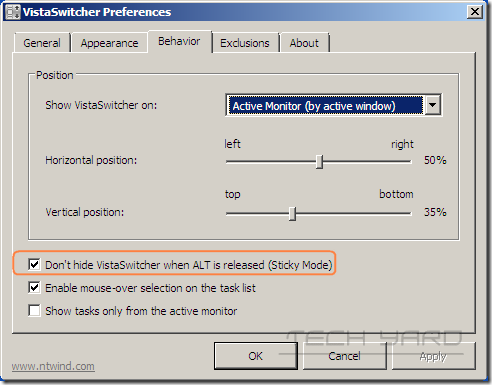 Launch VistaLauncher and “Right Click” on the tray icon and select “Preferences” and under “Behavior” tab select “Sticky Mode”. 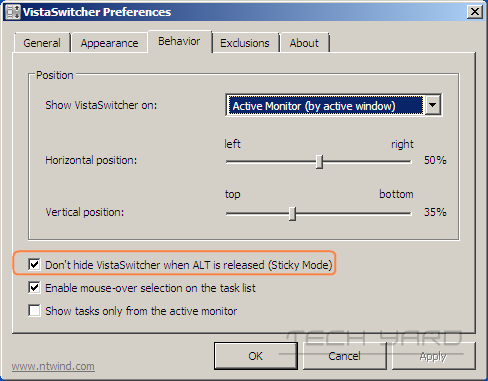 While VistaSwitcher is active the default “Alt+Tab” keystroke invokes VistaSwitcher. Download VistaSwitcher ( Windows Alt+Tab Replacement ).Compatible with Windows XP,Vista and Windows 7 (32bit and 64bit) .